"Ferrari Enzo" redirects here. For the person, see Enzo Ferrari. For other uses, see Enzo Ferrari (disambiguation). The Enzo Ferrari (also unofficially referred to as the Ferrari Enzo)(Type F140) is a 12 cylinder mid-engine sports car named after the company's founder, Enzo Ferrari. It was developed in 2002 using Formula One technology, such as a carbon-fibre body, F1-style electrohydraulic shift transmission, and carbon fibre-reinforced silicon carbide (C/SiC) ceramic composite disc brakes. Also used are technologies not allowed in F1 such as active aerodynamics and traction control. The Enzo Ferrari generates substantial amounts of downforce which is achieved by the front underbody flaps, the small adjustable rear spoiler and the rear diffuser working in conjunction, 3,363 N (756 lbf) is generated at 200 km/h (124 mph) 7,602 N (1,709 lbf) is attained at 299 km/h (186 mph) before decreasing to 5,738 N (1,290 lbf) at top speed. 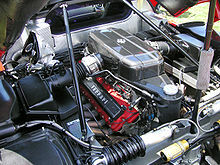 The Enzo's F140 B V12 engine was the first of a new generation for Ferrari. It is based on the design of the V8 engine found in the Maserati Quattroporte, using the same basic design and 104 mm (4.1 in) bore spacing. This design replaced the former architectures seen in V12 and V8 engines used in most other contemporary Ferrari models. The 2005 F430 is the second Ferrari automobile to get a version of this new powerplant. The Enzo was designed by Ken Okuyama, the then Pininfarina head of design, and initially announced at the 2002 Paris Motor Show with a claimed limited production run of 399 units and a price of US$659,330. The company sent invitations to existing customers, specifically, those who had previously bought the F40 and F50. All 399 cars were sold in this way before production began. Production began in 2003. In 2004, the 400th production car was built and donated to the Vatican for charity, which was later sold at a Sotheby's auction for US$1.1 million. Three development mules were built: M1, M2, and M3. Each mule utilised the body work of a 348, a model which had been succeeded by two generations of mid-engined V8 sports cars—the F355 and the 360 Modena—by the time the mules were built. The third mule was offered for auction alongside the 400th Enzo in June 2005, selling for €195,500 (US$236,300). The engine the Enzo is longitudinally-mounted and the car has a rear mid-engine, rear-wheel-drive layout with a 43.9/56.1 front/rear weight distribution. The powerplant is Ferrari's F140B naturally aspirated 65° V12 engine with DOHC 4 valves per cylinder, variable valve timing and Bosch Motronic ME7 fuel injection with a displacement of 5,998.80 cc (6.0 L; 366.1 cu in) generating a power output of 660 PS (485 kW; 651 hp) at 7,800 rpm and 657 N⋅m (485 lb⋅ft) of torque at 5,500 rpm. The redline limit is 8,200 rpm. The Enzo has a semi-automatic transmission (also known as the F1 gearbox) using paddles to control an automated shifting and clutch mechanism, with LED lights on the steering wheel telling the driver when to change gears. The gearbox has a shift time of just 150 milliseconds. The transmission was a first generation "clutchless" design from the late 1990s, and there have been complaints about its abrupt shifting. The Enzo has four-wheel independent suspension with push-rod actuated shock absorbers which can be adjusted from the cabin, complemented with anti-roll bars at the front and rear. The Enzo uses 19-inch (482.6 mm) wheels and has 15-inch (381.0 mm) Brembo disc brakes. The wheels are held by a single lug nut and fitted with Bridgestone Potenza Scuderia RE050A tires. The Enzo can accelerate to 97 km/h (60 mph) in 3.14 seconds and can reach 161 km/h (100 mph) in 6.6 seconds. The ¼ mile (~400 m) time is about 11 seconds, on skidpad it has reached 1.05 g and the top speed has been recorded to be as high as 355 km/h (221 mph). It is rated at 7 miles per US gallon (34 L/100 km; 8.4 mpg‑imp) in the city, 12 miles per US gallon (20 L/100 km; 14 mpg‑imp) on the highway and 8 miles per US gallon (29 L/100 km; 9.6 mpg‑imp) combined. Despite the Enzo's performance and price, the 430 Scuderia (an improved version of Ferrari's standard F430 production car) is capable of lapping the Ferrari test track just 0.1 seconds slower than the Enzo. The Porsche Carrera GT was 1.12 seconds faster in direct comparison on the only 0.98 miles (1,577 m) long Autodromo del Levante near Bari. Evo magazine tested the Enzo on the famed Nordschleife Circuit and ran a 7:25.21 lap time. The Enzo in the test had a broken electronic damper. They also tested it at Bedford Autodrome West circuit where it recorded a 1:21.3 laptime which is 1.1 seconds slower than the Porsche Carrera GT, but faster than the Litchfield Type-25. In 2004, American magazine Sports Car International named the Enzo Ferrari number three on their list of Top Sports Cars of the 2000s. American magazine Motor Trend Classic named the Enzo as number four in their list of the ten "Greatest Ferraris of all time". However, the Enzo Ferrari was described as one of the "Fifty Ugliest Cars of the Past 50 Years", as Bloomberg Businessweek cited its superfluous curves and angles as too flashy, particularly the V-shaped hood, scooped-out doors, and bulbous windshield. Before being unveiled at the Paris Motor Show, the show car was flown from Italy to the U.S. to be filmed in Charlie's Angels: Full Throttle. It was driven on a beach by actress Demi Moore. After filming was complete, the Enzo was flown to France to be at the Motor Show. The Enzo Ferrari is also briefly featured in the 2007 American film Redline. The Enzo Ferrari is also featured in the cover art for the WWE wrestling stable Evolution. Ferrari decided to use some of the technology developed for the Enzo in a small-scale program to get more feedback from certain customers for use in future car design as well as their racing program. The core of this program is the Ferrari FXX. It was loosely based on the Enzo's design with a highly tuned 6.3-litre version of the Enzo's engine generating a power output of approximately 800 PS (588 kW; 789 hp). The gearbox is specially developed for the car as well as the tyres (custom-designed for this car by Bridgestone) along with the brakes (developed by Brembo). In addition, the car is fitted with extensive data-recording and telemetry systems to allow Ferrari to record the car's behaviour. This information is used by Ferrari to develop their future sports cars. Like the Enzo, the car was sold to specially selected existing clients of Ferrari only. The initial price was €1.3 million. Unlike the Enzo, the clients did not take delivery of the car themselves. Rather, it is maintained and kept by Ferrari and available for the client's use on various circuits as arranged by Ferrari and also during private track sessions. The car is not expected to be suitable for road use. The Ferrari FXX program was continued until 2009 with the Ferrari FXX Evoluzione. Italian design studio Pininfarina had wanted to make a special one-off sports car based on the Enzo Ferrari flagship and was looking for a backer. After sending out feelers to its clients, American Ferrari collector James Glickenhaus eventually agreed to back the project by commissioning his car as a modern homage to great Ferrari sports racing cars such as the 330 P3/4, 512 S, 312 P, and 333 SP on the last unregistered U.S.-spec Enzo chassis. The car was named the Ferrari P4/5 by Pininfarina, and retains the Enzo's drivetrain and vehicle identification number. The car was unveiled at the 2006 Pebble Beach Concours d'Elegance and appeared in the September issue of Car and Driver. After its unveiling at Pebble Beach, the P4/5 returned to Europe for high speed testing, press days, and an appearance at the Paris Auto Show in September of 2006. Upon seeing the P4/5, the president of Ferrari Luca di Montezemolo felt that the car deserved to be officially badged as a Ferrari and along with Andrea Pininfarina and James Glickenhaus agreed that its official name would be "Ferrari P 4/5 by Pininfarina". Ted West wrote an article in Car and Driver about how this came to be: "The Beast of Turin". The Maserati MC12 is a two-seat mid-engine sports car that is a derivative of the Enzo Ferrari developed by Maserati while under control of Ferrari. It was developed specifically to be homologated for racing in the FIA GT Championship, with a minimum requirement of 25 road versions to be produced before the car could be allowed to compete. Maserati built 50 units, all of which were presold to selected customers. A track-only variation, the MC12 Corsa was later developed, similar to the Ferrari FXX. The Maserati MC12 has the same engine, chassis and gearbox as the Enzo but the only externally visible component from the Enzo is the windshield. Due to this, the Maserati MC12 is sometimes nicknamed the "Second Generation Ferrari Enzo". The MC12 is slower in acceleration (0–100 km/h or 0–62 mph being achieved in 3.8 seconds), has a lower top speed of 330 km/h (205 mph) due to engine tuning and less drag coefficient (due to a sharper nose and smoother curves) than the Enzo Ferrari. However, the MC12 has lapped race tracks faster than the Enzo before, specifically on the UK motoring show Top Gear, and the Nurbürgring Nordschleife (at colder outside temperatures). However this could be attributed to the MC12's Pirelli P-Zero Corsa tyres which have more grip than the Enzo's Bridgestone Scuderia tyres. The Maserati Birdcage 75th is a concept car created by automobile manufacturer Maserati and designed by Pininfarina, as a celebration of Pininfarina's 75th anniversary, and was introduced at the 2005 Geneva Auto Show. It is an evolution of the MC12 and draws inspiration from the Maserati Tipo Birdcages of the 1960s. There were rumors that Maserati was going to produce the car as the MC13, for which Maserati confirmed to have plans, but they were cancelled due to problems with Pininfarina giving Maserati total control over the design of the car. The Maserati MC12 Corsa is a variant of the MC12 intended for racetrack use. In contrast to the race version of the MC12, of which street-legal versions were produced for homologation purposes, the MC12 Corsa is intended for private use, albeit restricted to the track, as the Corsa's modifications make it illegal to drive on the road. The Corsa was developed directly from the MC12 GT1, which won the 2005 FIA GT Manufacturers Cup. The car was released in mid-2006, "in response to the customer demand to own the MC12 racing car and fueled by the growth in track days, where owners can drive their cars at high speeds in the safety of a race track", as stated by Edward Butler, General Manager for Maserati in Australia and New Zealand. In similar fashion to the Ferrari FXX, although the owners are private individuals, Maserati is responsible for the storage, upkeep, and maintenance of the cars, and they are only driven on specially organized track days. Unlike the FXX, the MC12 Corsa is not intended for research and development, and is used only for entertainment. A single MC12 Corsa has been modified by its owner to make it street-legal the conversion was carried out by German tuning firm Edo Competition. Only twelve MC12 Corsas were sold to selected customers, each of whom paid €1 million (US$1.47 million) for the privilege. Another three vehicles were produced for testing and publicity purposes. The Corsa shares its engine with the MC12 GT1; the power plant produces 755 PS (555 kW; 745 hp) at 8,000 rpm, 122 PS (90 kW; 120 hp) more than the road-legal MC12. The MC12 Corsa shares the GT1's shortened nose, which was a requirement for entry into the American Le Mans Series. The car was available in a single standard colour, named "Blue Victory", though the car's paint could be customized upon request. The MC12 Corsa possesses steel/carbon racing brakes, but is not fitted with an anti-lock braking system. Millechili, Italian for one thousand (mille) kilograms (chili), is the code name for a prototype sports car to be manufactured by Ferrari. It was a lightweight version of the Enzo Ferrari that would borrow features from Formula One race cars, using the F430's aluminium space frame on a 104.3-inch (2,650 mm) wheelbase. The hybrid power train utilising a V10 engine used in the car would exceed 610 PS (449 kW; 602 hp). The car was mainly a technological concept with no intention of production. The Millechili was developed in collaboration with University of Modena and Reggio Emilia, faculty of Mechanical Engineering. Millechili Lab is a cross-project in which students are working on light-weight car design. The Ferrari FXX program continued until 2009. The car continued to be improved under the Evoluzione kit, which continually adjusts specifics to generate more power and quicker gear changes, along with reducing the car's aerodynamic drag. The V12 engine under the Evoluzione kit generates 872 PS (641 kW; 860 hp) at 9,500 rpm and enables the car to accelerate from 0 to 100 km/h (0 to 62 mph) in 2.5 seconds. Certain changes were made to the gearbox in order to reduce the shift time to 60 milliseconds per shift, a reduction of 20 milliseconds over the original FXX. The car also underwent aerodynamic changes and improvements to the traction control system were made in order to make the car more responsive around the track.. The modifications also allow the Evoluzione to reach a top speed of 365 km/h (227 mph). ^ "Enzo Ferrari". Auto.Ferrari.com. Retrieved 19 November 2018. ^ "Ferrari Enzo, a 12 cylinder mid-engine berlinetta supercar". Retrieved 20 February 2015. ^ a b Newbury, Stephen. The Car Design Yearbook 2. Merrell. ISBN 1-85894-196-2. ^ "Ferrari Enzo Road Test" (PDF). ^ Peter Robinson (September 2002). "First Drive Review, Ferrari Enzo - It goes like never before. In fact, they're all gone". Car and Driver. Retrieved 27 April 2018. 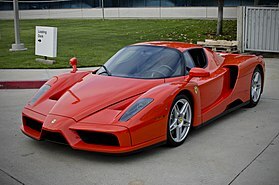 ^ "Ferrari donates proceeds of 400th Enzo to Pope". Autoblog.com. Retrieved 8 December 2005. ^ "$1M Ferrari Enzo donated to St. Jude Children's Research Hospital". luxurylaunches.com. Retrieved 14 September 2006. ^ "Ferrari M3 348 for sale". Supercars.net. Retrieved 11 August 2006. ^ "Enzo Ferrari". Auto.ferrari.com. Retrieved 12 August 2014. ^ "2002 Ferrari Enzo". RSsportscars.com. Retrieved 17 February 2015. ^ a b Grabianowski, Edward. "Power and Glory". How Stuff Works. Retrieved 8 February 2007. ^ "Volkswagen makes way for DSG". Paul Tan. Retrieved 11 August 2006. ^ Grabianowski, Edward. "Turning Point". How Stuff Works. Retrieved 25 March 2007. ^ **TIME AGO**. "Ferrari Enzo - Auto Shows". Car and Driver. Archived from the original on 25 January 2010. Retrieved 20 February 2010. ^ "2003 Ferrari Enzo Engine, Chassis, Dimensions, Price & Performance Data - Road Test Review". Motor Trend. Retrieved 2 September 2012. ^ "Ferrari Enzo - First Drive Review". Car and Driver. ^ "Ferrari Enzo". Car and Driver. Retrieved 27 July 2016. ^ "The 300kmh elite" (in German). Auto-Motor-Sport. ^ "fueleconomy.gov". Retrieved 4 October 2014. ^ Simon Green (30 September 2007). "First Drive: 2008 Ferrari 430 Scuderia". Edmunds. Retrieved 19 December 2007. ^ "Litchfield Type-25 v Caterham CSR 260 v Lotus Exige S v Radical SR3 1300 v Ariel Atom v Porsche Carrera GT v Ford GT v Ferrari Enzo v McLaren F1". Evo. ^ "Fifty Ugliest Cars of the Past 50 Years: Chevrolet Avalanche - BusinessWeek". Images.businessweek.com. Retrieved 2 September 2012. ^ According to Charlie's Angels: Full Throttle director McG. Charlie's Angels: Full Throttle DVD, special feature. ^ McCarthy, Alex. "Here's why Evolution is the greatest stable in wrestling history". Retrieved 2019-03-19. ^ a b "The Beast of Turin". Car and Driver (September 2006): 86–93. ^ "Ferrari 612 P4/5". Autoexpress.co.uk. Archived from the original on 11 August 2006. Retrieved 11 August 2006. ^ "Ferrari P 4/5 by Pininfarina and James Glickenhaus". FerrariP45.com. Archived from the original on 1 September 2006. Retrieved 1 August 2006. ^ "World Car Fans test drive MC12". World Car Fans. Retrieved 28 September 2006. ^ "Motor Trend Road Test". Motor Trend. Retrieved 2 October 2006. ^ "Carfolio: Maserati MC12". Carfolio. Retrieved 28 September 2006. ^ "The Stig's lap times". Top Gear website. Archived from the original on 13 July 2007. Retrieved 19 December 2007. ^ "Maserati's bird of paradise". Top Gear. 1 June 2005. Archived from the original on 17 March 2007. Retrieved 22 February 2006. ^ a b c d "Maserati Launches its Ultimate Super car". Maserati. Archived from the original on 7 October 2007. Retrieved 29 October 2006. ^ a b c "RSportsCars: Maserati MC12 Corsa". RSportsCars. Archived from the original on 21 October 2006. Retrieved 28 September 2006. ^ "IGN: Maserati MC12 Corsa". IGN. Retrieved 2 October 2006. ^ "Ultimate Car Page: Maserati MC12 Corsa". Ultimate Car Page. Retrieved 29 September 2006. ^ "Vorstellung Maserati MC12 Corsa". Autobild. Archived from the original on 18 July 2011. Retrieved 28 April 2007. ^ "2010 Ferrari Millechili". Car and Driver. Archived from the original on 16 June 2009. Retrieved 15 November 2009. ^ "RM Sotheby's - 2005 Ferrari FXX Evoluzione | Arizona 2015". RM Sotheby's. 2017-08-15. Retrieved 2018-11-19. ^ "Ferrari FXX Evoluzione" (in Italian). Topcarnews.splinder.com. 1999-02-22. Archived from the original on 2011-10-24. Retrieved 2010-02-02. ^ "28.10.2007 FXX programme extended". italiaspeed.com. Retrieved 2007-10-30. ^ "Ferrari FXX Development". Carautoportal.com. Archived from the original on 22 October 2012. Retrieved 2 September 2012. Wikimedia Commons has media related to Enzo Ferrari (automobile). This page was last edited on 7 April 2019, at 10:25 (UTC).